Frame Size (H x L): 47.5" x 58.25"
Flag Size (H x L): 34.75" x 44"
The personal headquarters flag of Philip Henry Sheridan, one of the most extraordinary Civil War generals. Made of merino wool and entirely hand-sewn, this was Sheridan's colors from the Spring - Summer of 1862, when he led the 2nd Michigan Cavalry with great effect and rose from Captain to Major General in just six months. Although Sheridan began his service with no previous cavalry experience, his rapid success with the mounted regiment caused Ulysses S. Grant to transfer his leadership to the entire cavalry of the Army of the Potomac. Among his many accomplishments, Sheridan went on to crush Confederate forces in the Shenandoah Valley and was instrumental in forcing Lee's surrender at Appomattox Courthouse. 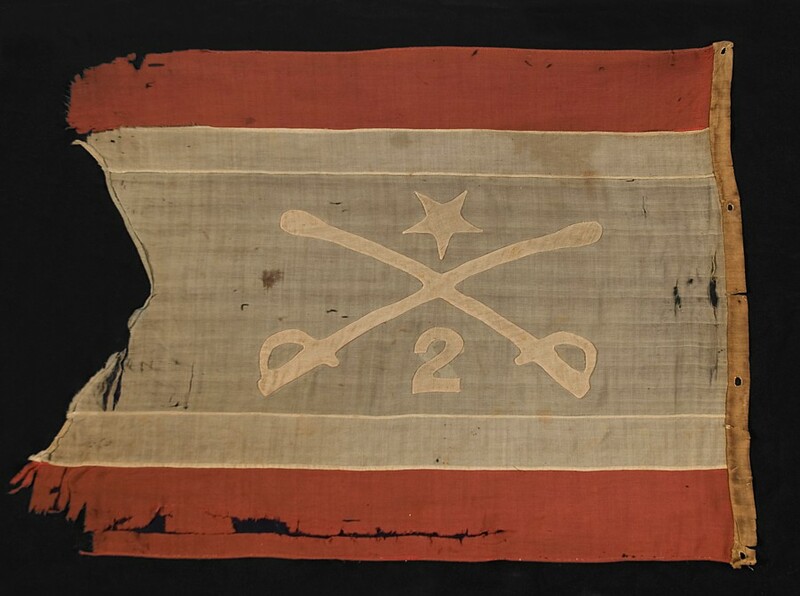 "THIS FLAG WAS USED BY GENERAL PHILIP SHERIDAN AS HIS HEADQUARTERS FLAG DURING THE CIVIL WAR PRESENTED TO NIAGARA FALLS LODGE #346 B.P.O.E. BY BROTHER G. EDWIN SAWYER"
During the mid-1960's, the flag was discarded by members of the club during a clean-up. 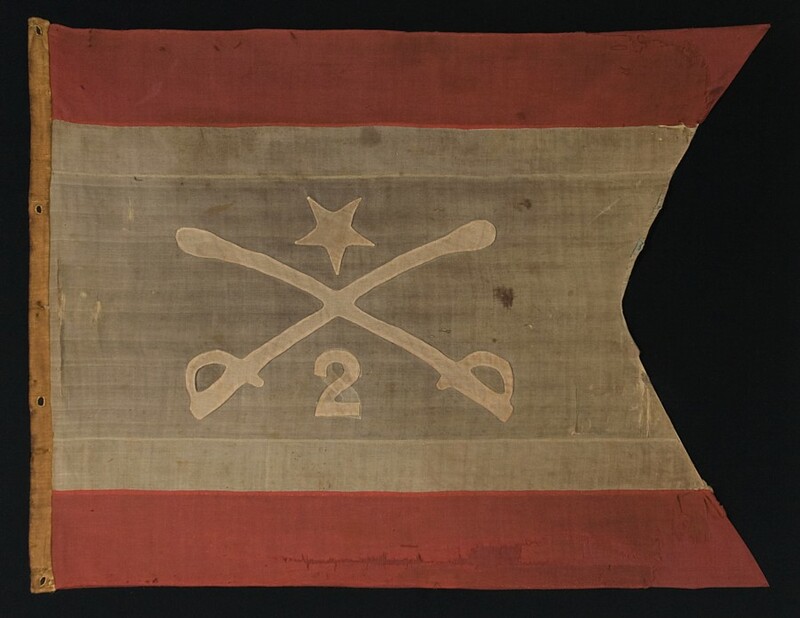 The flag was salvaged from the trash by Al Bobst, the club's manager, who donated it to a man by the name of Elmer Eperyes of Youngstown, NY, who afterwards displayed the flag in his home. When Eperyes died in 1989, his executor, Barbara McLaren, donated the flag to a man by the name of Gary Scott (residence unknown), who displayed it in his home until the sale of the residence ten years later, in 1999. At this point the flag was sold. Until now, numerous people have tried to solve two mysteries. One of these is "what year was the flag was donated to the Elks Lodge?" That question has never been answered. 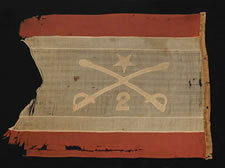 But the more important question is "who was G. Edwin Sawyer and how would he have managed to acquire such a flag?" This information was uncovered by one of our researchers. G. Edwin Sawyer was born in 1869, just following the Civil War. He was the son of a prominent Union Army officer by the name of Nathanial C. Sawyer, a paymaster who distributed $3 million dollars to Sheridan's army. He was thus well-known to Sheridan, but more than that, Sawyer actually left Washington, where he was stationed, to accompany Sheridan's army in 1865 when they went on their famous raiding expeditions through the Shenandoah Valley (the Valley Campaign). Mosby's Raiders, the famous Confederate unit, was harassing Union forces at the same time, in the same region. Each was hanging their captives and the bloody game went back-and-forth. It was during this time that Mosby's men stole Sheridan's payroll in the amount of $250,000. Sawyer, who had presumably spent most of the war at a desk until this point, remarkably set out on a dangerous mission to recover the money. Even more remarkable is the fact that he was successful in doing so and was afterwards awarded a brevet promotion to Lt. Colonel for "conspicuous bravery". No doubt Sheridan was grateful to Sawyer for his actions and it is seems likely that the flag was presented to him at this time as a heartfelt trophy. It is likely that Sawyer afterwards accompanied Sheridan until Union Cavalry forced Lee's surrender at Appomattox Courthouse. 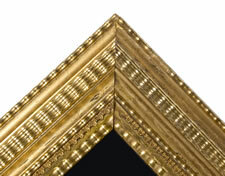 The crossed sabers are the traditional emblem of the United States Cavalry. 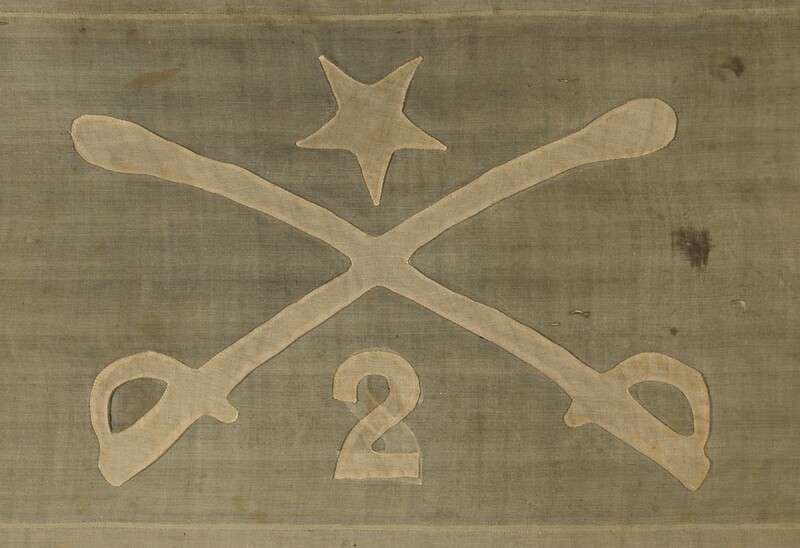 The "2" represents the 2nd Brigade and the single star represents Sheridan's status as a "one star" general. The flag is quite beautiful. 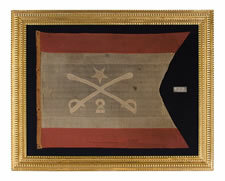 The exact format is unique, so far as I am aware, which isn't unusual for a Civil War period flag of a high ranking officer. Construction: The flag is accompanied by a textile analysis from leading expert Fonda Thomsen and measures approximately 35" x 44". The body of the flag is made of merino wool and is entirely hand-sewn in five lineal panels. The upper and lower panels create red bars, which flank white bars below and above, respectively. The center bar, while blue originally, has faded practically to grey. The star, numeral "2" and crossed sabers are made of merino wool and are double-appliqued (applied to both sides of the flag). These are white in color. 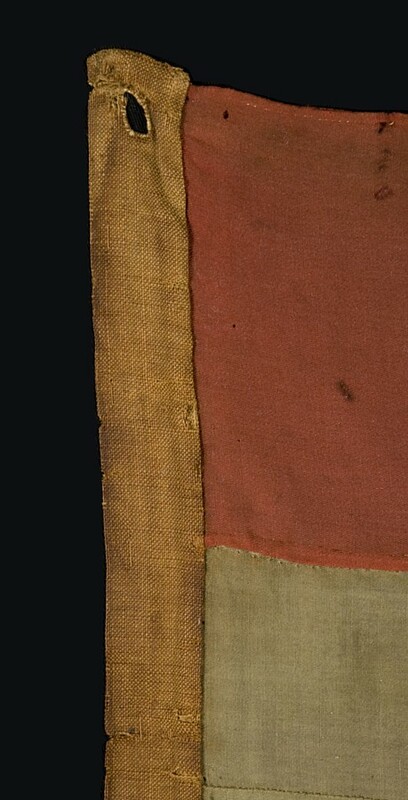 There is a coarse linen binding along the hoist with four whip-stitched, button hole grommets. The fact that the flag is made entirely of merino wool is very unusual. 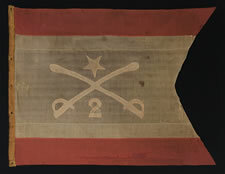 Most Civil war infantry and cavalry flags were made of silk; some were wool bunting, but few are entirely merino wool. This was a common fabric in homemade flags, but it typically seen in the canton and is seldom the only fabric. Commercial flag-makers advertised merino wool flags, but surviving flags made entirely of it are scarce. 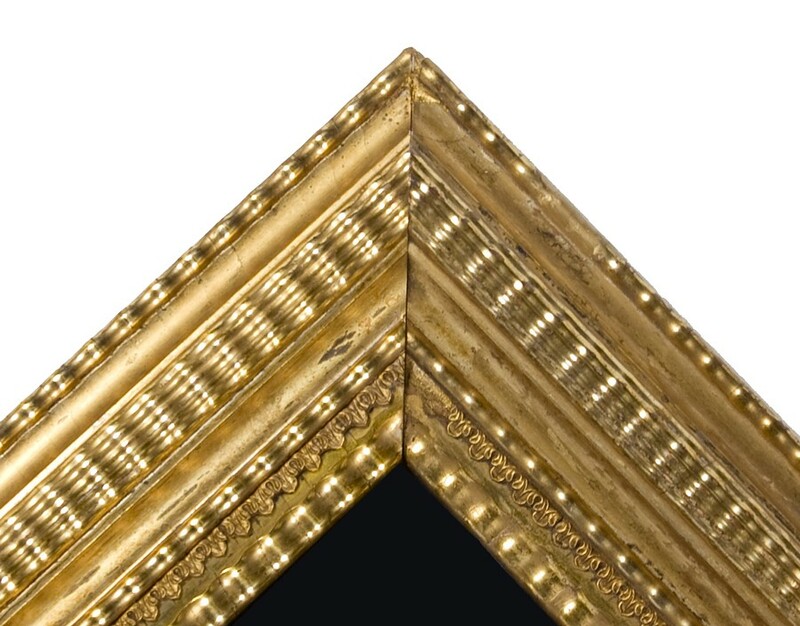 The mid-19th century, water-gilded, ripple-profile frame (47" x 58") is the best that I have ever encountered. Condition and mounting reports available.